Focus on the excitement of your Southern California getaway with Bluewater Vacation Homes and leave the details of planning to a professional. Enjoy a stress-free trip with a wide range of concierge and guest services. 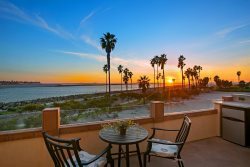 Arrange to have your San Diego vacation rental stocked with groceries upon your arrival, luggage delivered from the airport, meals catered and more. Hire expert planners to coordinate vacation itineraries or help plan a group or business retreat. Make every vacation minute count and spend less time hassling with baggage. Baggage Nanny offers curbside luggage pickup, secure storage and delivery so you can enjoy the day without worry and have your bags meet you at your Bluewater vacation rental at check-in. When it’s time to check out, they’ll store your bags until you’re ready to head to the airport. Local tip: Without all the luggage, rent a less expensive compact car that easily fits in narrow parking spaces around San Diego. As a guest of Bluewater, use promo code Baggage to book online and save 10%. Specializing in group lunch deliveries and drop-off catering, Bring It To Me is a takeout service that coordinates delivery from San Diego’s most popular restaurants right to your Bluewater vacation rental. They make it convenient for you to get the food you want when you want it. Meals arrive hot and fresh just like you would receive them in a restaurant. You’re on vacation, so let Elite Lifestyle Management (ELM) do the work for you! ELM is a luxury personal concierge service headquartered in San Diego. Treat yourself to a package customized to your specific needs that adds an extra layer of comfort and convenience during your stay. Guests are assigned a personal assistant who is an area expert and dedicated to your comfort. Services can be arranged by the hour or for the duration of your visit and include vacation home and neighborhood inspections, guest experience packages, front-of-the-line attraction privileges, grocery stocking, personal shopping, airport transportation, chauffeurs, child care, in-home chefs and special requests. Mention Bluewater and receive 33% off their normal rates. Skip a trip to the grocery store to stock your vacation rental and outsource the errand. With Instacart, have your favorite groceries and products delivered directly to your Bluewater vacation home from area grocery stores. Choose from 1-hour delivery or schedule same-day delivery at the time of your choosing. Instacart even offers future deliveries up to 7 days in advance. Receive your first delivery free on orders over $35. To make your stay seamless, we have partnered with KEY, a five-star service focused on elevating your travel experience . KEY’s team of local experts is ready to recommend and reserveeverything from essentials like transportation and pre-arrival grocery delivery to localexperiences like privately guided outdoor adventures and coveted restaurant reservations. Allyou need to do is simply arrive and relax. Request a personalized itinerary at key.co, via email at [email protected], or by calling 619.344.0990.